As anyone who goes through dark spells can attest to, it’s the simple things that bring you light and snap you back to what’s important. A few such moments occurred when a big cardboard box filled with toys from the Playskool Heroes collection arrived at my door. Inside were Rescue Bot Transformers, a buzzing, light-up Tony Stark laboratory and one big, green T-Rex representing Jurassic World. 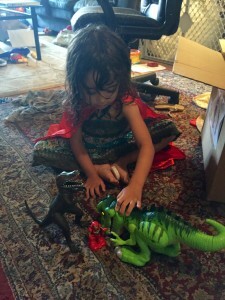 My depression lifting slightly didn’t come from the toys themselves, but from watching my 3 1/2-year-old girl enter a world of imagination, one where she adopted an imposing, roaring, chomping T-Rex. I’m not going to lie. When I took this creature out of the box, I got excited. What can I say? When I was a kid I was totally into dinosaurs and like most children, the T-Rex was my favorite, so when I saw what this toy could do – you push its back slightly forward and it not only roars, its eyes light up bright yellow, it bends down, opens its mouth and literally takes a big chomp followed by the sounds of crunching, swallowing and every so often, a burp – I wanted Sienna to go nuts and have the big green dino eat the little wrangler guy that comes with him and even Iron Man himself, but it wasn’t to be. 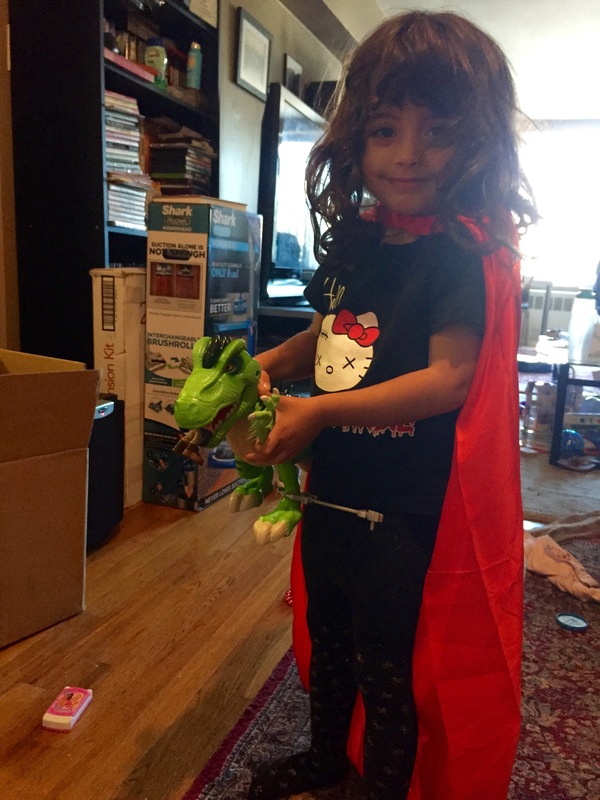 Instead Sienna showed her kind-heartedness. She saved the wrangler from the dino’s jaws, held him to her lips and whispered, “It’s ok. It’s ok.” And you know what? My stomach fluttered a bit. The dark clouds opened slightly and the sun shone through. We happened to go to my parents’ later that evening and we brought the toys with us. 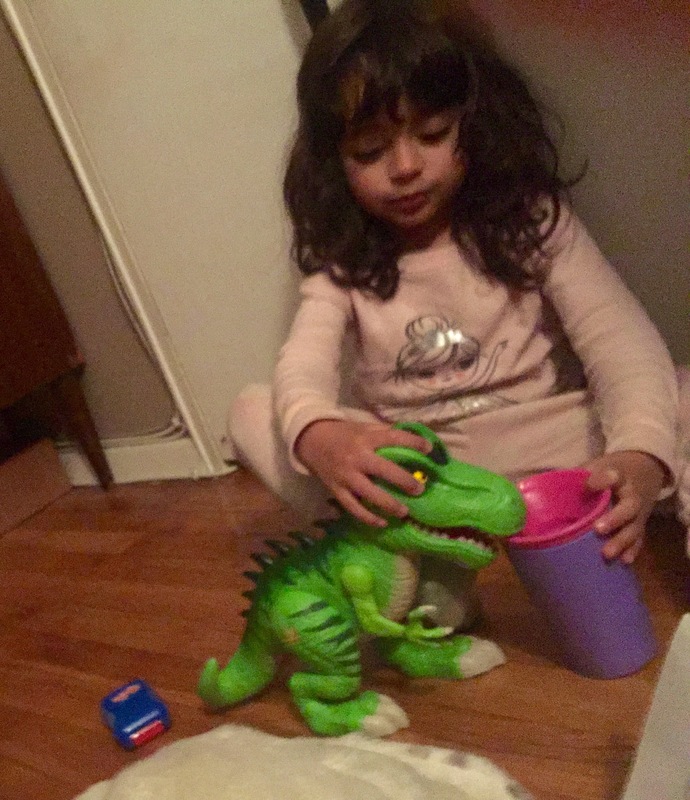 Both my mom and dad loved “Dino-Roar” (as Sienna christened him from an episode of Peppa Pig) and my mom went downstairs to the basement to find my old T-Rex, an itty bitty plastic thing that paled in comparison to Sienna’s new pet, but the memories flooded me and I was proud to share this love with my daughter (even if mine was a bit more bloodthirsty 35 years ago). Immediately she adopted my old T-Rex and brought him home. I sat across from my daughter and had Dino-Roar attack my old T-Rex, but Sienna quickly flew Iron-Man in to stop the fray! And the dinos listened. They stopped their battle and I watched, that little flutter in my stomach, that pride at having such a wonderfully compassionate little girl once more blowing away the gathering storm. At night-night, Sienna let Dino-Roar drink from her sippy cup and then gently placed him in her lap as Mommy read them a story with my old T-Rex sitting nearby. 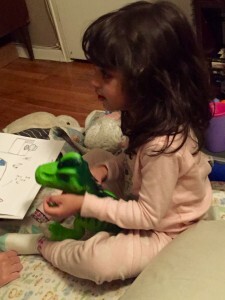 When story-time ended, she cradled Dino-Roar in her arms along with a stuffed kitty and her precious scarf, placed her thumb in her mouth and eventually flew away to dreamland. Each toy brings a child new wonders, but not all hit the sweet spot…not all bring out the best in that child’s personality. 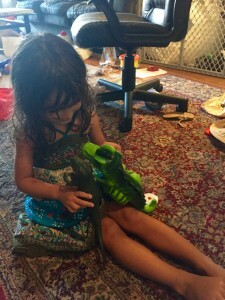 Playskool Heroes’ Jurassic World T-Rex did just that for Sienna and in so doing, it helped momentarily alleviate the gloom swirling through my head. When you suffer from the disease known as depression, even an instant of lightness can be a harbinger for an end to the spiral. It hasn’t happened yet. The panic attacks remain. In my mind the rational still fights the irrational like two toy T-Rexes going at it before Iron-Man flies in and yells, “What are you doing? You’re best friends! Get on the same page!” But the end is coming. Watching Sienna play with my old dino and her new and waaaaaaaaay improved Playskool Heroes dino let in a little light and told me that Iron-Man’s on his way.